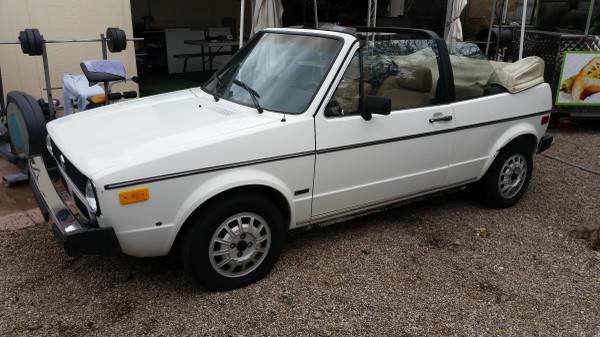 One of the more underrated convertibles of the last 30-40 years, and in fact one of few convertibles available in the early 1980s, is finally escaping its made-for-cheerleaders stigma. The earlier cars, without all the heavy modernizing embellishments of the late 1980s and early 1990s, are actually pretty smart looking and are great for being able to hold 3 other friends (instead of the usual 1 in a roadster). Fitted with a later GTI powertrain, these could actually be fairly sporting and give an E30 3-series convertible a good run for its money. 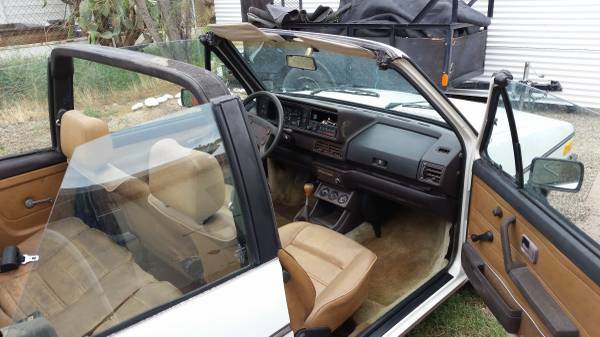 But perhaps that’s part of the problem right there – a 1988 BMW 325i convertible in decent condition is maybe double the price of a Rabbit convertible, but in fully-depreciated used car terms, that’s a couple grand for vastly more prestige, six-cylinder power, and whatever’s left of the famous BMW handling. 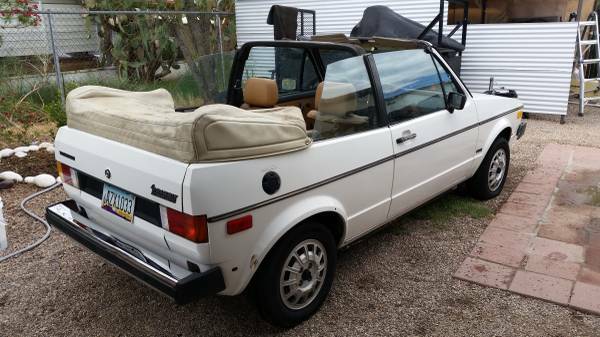 Nonetheless, check out this 1982 VW Rabbit Convertible for sale for $1500 in Tucson, AZ. Can we get over the whole chick car thing too? If it’s a good car, it’s a good car – who cares if cheerleaders were the first ones to figure that out? Do you like convertibles? Do you like a light, 4-cylinder open top car? Do you like crisp, angular Italian-designed bodywork? Do you like taking your friends along for a ride? And if you really can’t deal, drop it and put some rubber band tires on some knock-off BBS wheels like all the cool Dubbers do. White suits these early cars very well, and doesn’t make them look like a wedding cake as the newer cars do. Okay, so this car has issues. Cranks but doesn’t start, possible dead distributor, worn top, old battery – but these cars are simple and you can probably still get parts at the local chain store, or if you’re lucky, an imported car parts store. And if enough of the engine is worn, there’s your excuse to upgrade to something from a later VW – Corrado G60, anyone? You name the conversion, it’s probably been done, and there’d be no satisfaction like blowing someone off in your chick car. The top will likely be expensive to replace, but it’s a nice top with a proper lining like you only got in real-deal luxury cars back then. Hmm, seems to be a bit of sun damage to the rear seat. Well, that’s to be expected in Arizona, and with any luck, there’ll be no rust. The rest of the interior looks quite decent in this shot, and as this is a German-built car, you’ll avoid the tacky Westmoreland-car interiors. Impressively, this car still has its top boot – the kind of thing you’d expect to be lost on a cheap, 32-year-old convertible. Would you risk it? $1500 is not much to gamble in the name of some top-down summer fun with a few friends. This entry was posted on August 5, 2014 at 12:04 am and is filed under Feature. You can follow any responses to this entry through the RSS 2.0 feed. You can leave a response, or trackback from your own site.